A convenient example that addresses an ETS issue “Free Allocation in the New Zealand Emissions Trading Scheme A Critical Analysis” Policy Quarterly – Volume 6, Issue 2, February 2010, by Christina Hood will do nicely. The author has impeccable credentials and presents some perfect material for us to gain an insight into the sphere of policy influence in respect to climate change policy. It should be noted that the article has been sourced from outside of the stream that would normally be compiled into executive summary for ministerial consideration, but it is not out of the realm of possibility that an article such as this may gain some traction on the strength of its source — hence the caveat next. The selection of Christina Hood’s article is not to take issue with Christina specifically but with the approach to economic analysis of the ETS generally. The root cause of the lack of consideration given to wider scenario possibilities lies with scientific deficiencies in the ETS basis and governmental reluctance to investigate the alternatives. It would be unfair to berate those undertaking economic analysis of the ETS for blithely accepting the consensus findings of another professional group (climate science), but it does reveal shortcomings in critical thinking. It must be assumed that Christina still wields influence at a high level after a stint as policy adviser to the minister for energy and climate change issues during 2002–2005; she is also not without scientific understanding because her resume includes a PhD in physics. I hope that, since selling her soul to the climate change spectre in exchange for pieces of policy-peer recognition (if not silver), Christina has spent time in monastic solitude seeking redemption. I am also hopeful that her contemplation will in time produce an outpouring of literary penance couched in an extended economic analysis and comparison of alternative New Zealand economic scenarios with and without an ETS (or carbon tax), based on alternative hypotheses of anthropogenic carbon and natural cycle climate drivers. Most revealing in that analysis would be the budget foregone in order to feed the appetite of the voracious climate change beast. For example, what is the opportunity cost to health, education or foreign aid due to the money-multiplier lost to the productive economy and instead allocated to ETS carbon credit purchase and sector protection or subsidy over the next 50 years? If we are looking for an objective approach we will have to ignore what seems to be the author’s premise that anthropogenic carbon emissions are the most significant climate driver and therefore the assumption of that basis goes without saying. We will also overlook the petulant introduction “Submitters were given two weeks to make written submissions, and some were asked to appear for oral submissions with only a few hours notice. Very little economic analysis of the legislation was released by the government at the time or has been since.” If the critique following the introduction in response to the minimal analysis had explored the differences of economic impact in an economy with and without an ETS, then the statement would gain validity, but if the major climate driver is unquestionably anthropogenic without acknowledgement that there might be other possibilities, then who cares what analysis is done because the scheme will wreak economic havoc anyway, in whatever configuration on an invalid basis. Tweaking here and there to make a market intervention more palatable to economic purists won’t change that. Next we will overlook the author’s assertion that an emissions price of NZ$100 per tonne by 2050 is “more plausible” than NZ$50. This statement was made in the context of $200 billion foregone government revenue by 2050 from free allocation of units, but has the author really thought about what a $100 price on emissions means to New Zealand’s international competitiveness and GDP, and how that price will be achieved (by market means?)? Finally, we will overlook the economic niceties that the author bemoans have been circumvented by the protection and subsidy of industry and agriculture enacted in the latest incarnation of the ETS. It is a matter of course that a government will seek ways to do that when it gained its right to govern via a manifesto aligned to the interests of those same sectors. In other words, votes trump economic theory. Billions of dollars have been sunk globally in the financial black hole of anthropogenic climate change that could otherwise have been invested productively for the future wealth of nations. The range of beneficiaries of this money-spinner is mind boggling and the first that come to most minds are climate scientists. But consider for a moment the suppliers of supercomputing facilities world-wide, including architecture, building construction, air conditioning and computers. These facilities are duplicated over and over as the number of IPCC climate model submissions attest. The last decade has exposed the negligence of climate modellers to present to the world the alternative scenarios of future climate using realistic natural climate drivers because their anthropogenically forced outputs have not tracked the observed conditions of the last decade and have been worse than useless as a basis of infrastructure planning, particularly in the UK and Australia. Economists, whether government employed or contracted, are also beneficiaries but squarely positioned to have major influence on the ministerial decision-making process — i.e., they have power. With power, though, comes responsibility. What we have witnessed in the formulation of the ETS is an abdication of responsibility by those in the best position to speak up on behalf of a public far from the reins of power when decisions with profound consequences for the New Zealand economy and significant impositions at a personal level were being made. Economic analysis that does not incorporate the spectrum of sensibly anticipated risks is negligent, but what do we see? Just the one anthropogenic scenario with some variations to provide the illusion of multiple scenarios provided by climate science and quiescence from economists. If there were misgivings in the economic fraternity as to the veracity of the anthropogenic assumption and the possibility of erroneous economic modelling, then either they were not voiced or they were voiced only in passing — they were certainly not laid out in the public domain. The propensity of economic analysts to abdicate responsibility is evidenced in another report “Economic modelling of New Zealand climate change policy” by NZIER – Infometrics. Their rider: “While every effort is made by Infometrics to ensure that the information, opinions and forecasts provided to the client are accurate and reliable, Infometrics shall not be liable for any adverse consequences of the client’s decisions made in reliance of any report provided by Infometrics, nor shall Infometrics be held to have given or implied any warranty as to whether any report provided by Infometrics will assist in the performance of the client’s functions.” Here’s our work, pay us, but don’t hold us accountable to it. It is perhaps fortunate that these people are not brain surgeons or car mechanics, though their proximity to the nation’s economic reins is tragic. Our look at Christina Hood’s article reveals an analyst who is concerned only with how the ETS stacks up when economic theory is applied to it but ignores the very basis of the analysis and how the introduction of an obvious alternative would nullify the need for possibly hundreds of billions of dollars being syphoned from the long-term productive economy of New Zealand. This is negligence at any level – professional, academic, official or in the forum of the Institute of Policy Studies. But no — the opportunity is of a vastly different nature. The New Zealand ETS is scheduled for review in 2011. Much has happened in the last 14 months to warrant an objective scrutiny of the scientific and economic justification for it that has not been carried out to date. The IPCC version of climate change has been given right of passage to the exclusion of competing climate driver hypotheses. Now more than ever, the anthropogenic assumption must be called into question in light of the spectacular failure of national institutions, notably the UK Met Office and CSIRO, to provide climate scenarios that even remotely resemble what the respective populations of Britain and Australia are grappling with. That failure is highlighted by the success of individuals operating in a commercial environment to do what national institutions cannot — make useful forecasts using natural climate drivers as their mainstay. It is of concern that our National Institution of Water and Atmospheric Research (NIWA) are now using “emissions scenarios” as the basis of long-term climate prediction when that approach is making equivalent overseas institutions a global laughing stock. Why join them? When the reality of an alternative natural climate driver scenario is finally introduced to economic analysis of the ETS, the hundreds of millions of misallocated resource dollars will be immediately returned to their rightful place economically and the analytic negligence of the past will be rectified. The non-discounted price for CO2 will be set by the market, as I am led to understand. To date, no one has explained to me how this market price is reached and how NZ businesses are supposed to plan for it. This raises all sorts of issues, some I’ve tried to address in reply. The “market” being European.in lieu of any other, so the NZ price would be aligned to that I’m guessing. First problem being (for them), that the “market” price wont reach the threshold that makes any difference which seems to be in excess of $100. This because coal is so cheap relatively. Next problem being (for us), is what is known euphemistically as “carbon leakage”. This is the inevitable situation where commercial operators hightail it out of the country to somewhere (anywhere) that the tax is not imposed. “Carbon leakage” is not observed in economic modelling until emissions prices are well over AU$200/ tCO2, so we can breathe a sigh of relief because we can rely on models to substitute our common sense – apparently. I’m inclined to be more than a little sceptical given the situation we saw here in Mt Maunganui when NZ Controls moved their production to China where they could employ 19 Chinese instead of 1 Kiwi. F&P is similarly pragmatic and Seeka Kiwifruit trialled packing in China during the 2010 season. Then there’s Vietnam, Cambodia and India. An Indian corporate has just outlaid AU$850m for WA coal so I don’t think they’re worried too much about carbon prices – bring it on, they say. The last British steel-making enterprise shipped off to India. Economic modelling? Yeah right. Immediately after a NZ corporate financial controller inserts “Carbon Price $100″ in his/her spreadsheet and hits “Enter”, the Planning Dept will receive a memo requesting options for off-shoring any part of the operation that incurs the cost irrespective of what “economic modelling” might say..
c. climate change measures outside of the NZ ETS (except to the extent that a – c above raise broader issues about the best means of meeting New Zealand’s international obligations). f. equity between sectors and groups – the distribution of costs and benefits between sectors and groups (including iwi). leaving the government with surplus units to sell2. level of subsidy specified in the Bill. Also see subsidy costs Figure 4. State run Indian companies want AU coal (TATA already there). No worries about carbon prices for them but plenty for Glenbrook Steel NZ. TATA Steel said today it is studying Rio Tinto’s $3.9 billion bid for Riversdale Mining, as it reviews alternatives to the offer. Earlier today, International Coal Ventures said it has hired Citibank to advise on a counterbid to Rio Tinto’s $16-a-share offer for Riversdale Mining. “We have appointed Citibank. The merchant bank will submit its report in the next two weeks, based on which we will take a call on counter-bidding for Riversdale,” chairman C.S. Verma told reporters. ICVL is a joint venture between five state-run Indian companies — Steel Authority of India, NTPC, NMDC, Rashtriya Ispat Nigam and Coal India. The Emission Trading Scheme (ETS) needs to be given “a set of teeth” by the panel that is reviewing it, the Labour Party says. Climate Change Minister Nick Smith yesterday announced the panel which will study the way the ETS is working and whether it should continue to full implementation. The scheme makes industries pay for some of their greenhouse gas emissions and is being introduced in stages. Labour’s climate change spokesman Charles Chauvel said today it should be fully implemented immediately. “If New Zealand wants to avoid burning a lot of gas to generate electricity, to achieve a long-term turnaround in deforestation and bring about changes in consumer behaviour around energy and transport use we need a stronger ETS,” he said. The review panel will start work in February 2011. That would mean a carbon price of NZ$50. Through its ECX product suite, ICE Futures Europe is the leading global marketplace for trading carbon dioxide (CO2) emissions. ICE Futures Europe currently offers derivative contracts on three types of carbon credit: ICE ECX EU allowances (EUAs), ICE ECX Certified Emission Reductions (CERs) and the world’s first ICE ECX Emissions Reductions Units (ERUs). These idiots make it up as they go along. Note that the price is $5.50 LESS than the current NZ price of $25. Completely unnecessary @ any rate because CO2 is not the climate driver. But Charles Chauvel wants an extra $215,250,000 from coal alone. @ NZ$50.00 per tonne for CO2 emissions and 3.12 Mt coal consumption per year. NZ$4.3 billion over 10 years just from coal. What the NZ ETS means in costs to the major coal users. Newcastle AU power station coal currently @ ~NZ$146 tonne. How the govt calculates emissions from calorific value and energy (91.20 ktCO2/PJ) i.e.Not a conversion factor from weight of coal to weight of CO2. In previous inventory submissions, New Zealand’s emissions from coal combustion in the public electricity and heat production subcategory were calculated using the emission factor for sub-bituminous coal of 92.99 kt CO2/PJ (Baines, 1993). In 2008, the electricity generator contacted the Ministry of Economic Development to request an update of this value. The assumption was made that using the overall sub-bituminous value for the public electricity and heat production subcategory (91.20 ktCO2/PJ) is consistent with other coal burning activities in New Zealand. This updated emission factor is included for the whole time series (1990–2007) for the public electricity and heat production subcategory. It gets real interesting from about the 40 min mark. Food for thought, eh. Whilst generation from renewable sources is making an increasing contribution to the energy mix, globally the technologies of choice are combined cycle gas turbine and coal. We are of the view that dynamic efficiency can only be maximised if energy policy is agnostic as to generation technology and that concerns about environmental externalities are best addressed through appropriate policy instruments that price the externalities taking account of the local or global nature of the externalities, e.g. cap and trade schemes for greenhouse gases. Thanks Mike and I hope you have a peaceful Christmas (or boisterous if you wish). Me, I’m big on peaceful nowadays. I’m not a video fan to be honest – I’ll wait for the book. The Greenhouse Policy Coalition was formed in 1996, and represented almost all of New Zealand’s largest users of power. Its members included New Zealand Steel, New Zealand Aluminium Smelters, Solid Energy, Fonterra, Methanex New Zealand and four pulp and paper manufacturers. In 2009 the coalition argued that implementing the Kyoto Protocol on climate change was a significant risk to New Zealand’s economy. It called for a moderate and measured response by government. In 2008 Rio Tinto Zinc, owner of the Bluff aluminium smelter, and New Zealand Steel, owner of the Glenbrook steel mill, told government that their New Zealand businesses would become uneconomic if they had to pay for emissions when competitors overseas did not. The companies talked of ceasing to invest in and closing their New Zealand operations. Shown here is Ray Deacon of Rio Tinto Alcan NZ, talking to the parliamentary select committee considering climate-change legislation in 2008. In the background is Xiaoling Liu, president of Rio Tinto Alcan’s Primary Metal Asia Pacific region. A re-worked emissions trading scheme, introduced in 2009, substantially reduced industry responsibility and costs, and included a capped price for carbon units. Isn’t all this FOR our welfare ? · New Zealand Governments do not like using subsidies, while the EU is much more ready to use them, e.g. it provided 2.9 billion euros of support to coal mines in 2008 and is currently discussing whether to continue this sort of assistance. Presumably these high prices of CO2 would mean extra big profits for the electricity companies. Bizarre! The GPC website contains no AGW rebuttals or. peer reviewed papers, CCG is light years ahead and look at the resources they have at their disposal. They got nothin – what a bunch of wimps. The carbon price is a penalty for say Genesis that operates Huntly, so it’s a loss for them – not a profit. The thermal penalties must raise wholesale market prices overall especially in dry years so that hydro and other renewables profit then (if they’ve got the water and wind that is). But hydro in New Zealand is not increasing anywhere near the rate of thermal increase so the penalty hits any new generation basically (except for wind) because our hydro options are near an end. Once the planet is saved and NZ Steel and Bluff Aluminium have shut down and gone to India we will have lots of surplus power so prices should come down significantly i.e. they will have to give it away and a good thing because we wont have jobs to pay for it. Obviously if the wholesale price rises then Genesis will recover some (maybe all) of the loss. I doubt they would profit at all but it is a possibility. Their analysts should have all that worked out and modelled. Increased wholesale electricity prices then flow on to retailer to consumer and to any activity that uses electricity so the consumer gets hit again e.g. refrigerated supermarket goods. i.e. Everyone’s complacent because much of the country is benefiting from the free allocation and disbursement of units. Not much fun for those sectors that missed out however. But when the free allocation runs out – what then? See Dr Christina Hood’s submission below and article linked in the above post for the answer. Effective price to 2012 – not 100% sure that Fonterra pays $12.50 or $25. Their own estimate of $38m in the first year indicates that perhaps it pays $25. This figure should be reduced to account for the effective price of $12.50 from 2010 -2012 (some sectors still $25?). Also using the effective price to 2012. The easy part of this is because “without” is almost a no-change scenario so most of the difference between “with” and “without an ETS” is just the incremental impact of all the $ quantification above. The tricky part is making a realistic assessment of how much NZ would be penalized by the EU say if NZ was “without” an ETS and would there be a European consumer backlash? The criticism that the ETS is to protect European markets was long ago leveled at it in view of the fact that those markets are declining. Also tricky is deciding if revenues gained from exports to emerging (developing and not subject to an ETS) markets would off-set the Euro penalties. There’s probably economic modeling of this somewhere but surely the penalties would be easily off-set by not having to pay the carbon tax (ETS) in the first place. That’s a pity. Don’t think they are doing a book. This was probably a bit harsh without knowing where GPC stands so I emailed David Venables Executive Director Greenhouse Policy Coalition to find out. So I’ve obviously got it wrong but I do find it surprising that the basis of the ETS is not being attacked by them given the evidence contrary to the iPCC version of climate change. I have provided David with links into as much of the CCG resources as I think he would need to see the contrary science without overloading him so at least he will have food for thought. This doesn’t really surprise me at all. There are just playing consensus politics. I don’t know if Piers’ science is correct, but he seems to have a much better strike rate than the Met Office. Yes, Piers’ strike rate is 85% and that’s been verified by a peer reviewed study. He is also banned from gambling on weather forecasts because of that. But it’s not just Corbyn. The Watts and Copeland Sinusoidal Solar-Lunar Model has proved itself for Ian Holtom against CSIRO/BOM in Australia and there are other examples. Boris Johnson is taking an interest and I note that his article about Piers Corbyn “There’s a mini ice age coming, says man who beats weather experts” was top of the most read environmental articles in the Sydney Morning Herald for some time. I’m starting to think that this is the better card to play. There are literally hundreds of peer reviewed papers that can be presented but the opposition always finds a way to ignore them – not IPCC, not from “the team”, not in a “top” journal, physicists are not “real” climate scientists, not approved by RealClimate and not in their Wiki so it’s not “reputable etc. They also seem to require one catch-all paper that encapsulates every AGW rebuttal known to man and if that can’t be presented you lose. Never mind that there is not one paper that defines the AGW hypothesis. It’s a hard debate to engage in as can be seen in the NZ Herald comment forums. You can put up “800 peer reviewed papers” and it’s either “give me one” or talk-to-the-hand. But here we have someone who puts his money where his climate driver is and wins against the massively funded UK Met Office. Now Bryan Leyland is doing the same and although we wont know for two years if he’s won, if it’s anything like his first effort, he will. The general populace is far more interested in this than scientific papers unfortunately. That will be when the half-price offer ends on ETS units and if not then it will be when the Govt runs out of free units. What Australia does will have a bearing too. And Piers Corbyn is not the only one. On this side of the world Ken Ring doesn’t do too badly – around 75% I am given to understand. Certainly the farmers in our part of the Waikato swear by him. If my Fieldays experience was anything to go by he was far more popular than the weather gnome (oops! Sorry, weather Ambassador). I understand Ring bases his predictions on the moon’s effects on the atmosphere – I guess somewhat akin to the effect on the oceans. Mind you, I have always believed that the NZ Met Service does get it right 100% of the time – you just have to wait long enough. Maybe you could compare those with Ken Ring’s forecasts. * On average, at nearly all elevations, there will be a gradual decrease in snow as the century progresses. The time frames don’t overlap but NIWA has fixed a trend that can be compared. BTW, NIWA used “emissions scenarios” for their snow level prediction. NIWA are trying to predict the snow levels in NZ for 2080 2099? Do they take us for idiots? There are actually real problems to be solved in this country, and these computer generated fantasies do not fit into this category. Why should the financial penalties of the ETS continue beyond the expiry of the Kyoto commitment period on 31 December 2012? The chances of any second commitment period are now close to zero. Much of the rationale for the ETS has always been based on the alleged liabilities of the Government (ie the taxpayers) to purchase carbon credits to meet Kyoto targets. The estimated cost of those foreign credits sits on the Government’s balance sheet as a very substantial contingent liability. The supportive NZIER/Infometrics modelling took as a given the ongoing life of such liabiities (until 2030), and justified the ETS as a means of reducing the outflows required to buy offshore credits. The Ministry for the Environment’s Regulatory Impact Statement which accompanied the National-led Government’s 2009 amendment to the ETS, was trounced by Treasury for its total failure to comply with the RIA Handbook published at http://www.treasury.govt.nz/publications/guidance/regulatory/impactanalysis. Surely, the 2011 Review is a prime opportunity to overcome that departmental embarrassment and publish a complying RIS. Oh, how neat is that, Clarence! And any RIS must open the door to the “science” — the reason for having a response to “climate change” at all. Which has to go a long way to explaining why the government opted to ignore an RIS in the first place. This reasoning gives the CSC a credible path to make ground-breaking submissions to the committee. It would be one of the first government forums anywhere to host a discussion of the science. I don’t have the time either. Ring publishes a book annually and appropriate extracts are published in at least one farming magazine. Being rather niggardly (and not really needing it) I have never purchased a copy. I don’t know how far out he makes predictions. Like Piers Corbyn he is subject to criticism and ad hominem attacks. What I mean here is that the penalty hits a significant amount of on-going new generation because the growth is coming from gas – not hydro. There is wind and geothermal growth obviously but I was highlighting gas vs hydro. And as Andy has shown us, even geothermal gets hit too. I’m wrong here. He wants all sectors to pay $25 – not some paying $12.50. Doesn’t look nearly as bad now. Trade confirms adoption of the agreement, Environment doesn’t – what’s up with that? How then to pitch to the RIA? Alternative natural climate driver hypothesis and proof of success in prediction as opposed to the failure of CO2 forced predictions? AGW debunking via peer-reviewed physics and climate science papers? AGW debunking via anecdotal and empirical evidence that AGW has stopped? “Analysis of the sun’s varying activity in the last two millennia indicates that contrary to the IPCC’s speculation about man-made global warming as high as 5.8°C within the next hundred years, a long period of cool climate with its coldest phase around 2030 is to be expected. It is shown that minima in the secular Gleissberg cycle of solar activity, coinciding with periods of cool climate on Earth, are consistently linked to an 83-year cycle in the change of the rotary force driving the sun’s oscillatory motion about the centre of mass of the solar system. As the future course of this cycle and its amplitudes can be computed, it can be seen that the Gleissberg minimum around 2030 and another one around 2200 will be of the Maunder minimum type accompanied by severe cooling on Earth. This seems to be the thesis proposed by Piers Corbyn too. These theoretical considerations have been corroborated by practical results. Predictions based on cycles in the sun’s motion turned out to be correct. My long-range forecasts of precisely defined classes of energetic X-ray flares and strong geomagnetic storms, covering the period 1979 – 1985, reached an overall hit rate of 90 percent though such events show a very irregular distribution. These forecasts were checked by the Space Environment Center, Boulder, and the astronomers Gleissberg, Wöhl and Pfleiderer (Landscheidt, 1986; Landscheidt and Wöhl, 1986). Accumulations of strong geomagnetic storms around 1982 and 1990 were also correctly forecast several years before the events. I predicted, too, in 1984 (Landscheidt, 1986, 1987) that the sun’s activity would diminish past 1990. Just this happened. Though a panel of experts (Joselyn, 1997) had predicted in 1996 and even two years later that sunspot cycle 23 would have a large amplitude similar to the preceding cycles (highest smoothed monthly sunspot number R = 160), the observed activity was much weaker (R = 120). The IPCC’s judgement that the solar factor is negligible is based on satellite observations available since 1978 which show that the Sun’s total irradiance, though not being constant, changes only by about 0.1 percent during the course of the 11-year sunspot cycle. This argument, however, does not take into account that the Sun’s eruptional activity (energetic flares, coronal mass ejections, eruptive prominences), heavily affecting the solar wind, as well as softer solar wind contributions by coronal holes have a much stronger effect than total irradiance. The total magnetic flux leaving the Sun, dragged out by the solar wind, has risen by a factor of 2.3 since 1901 (Lockwood et al., 1999), while global temperature on earth increased by about 0.6°C. The energy in the solar flux is transferred to the near-Earth environment by magnetic reconnection and directly into the atmosphere by charged particles. Energetic flares increase the Sun’s ultraviolet radiation by at least 16 percent. Ozone in the stratosphere absorbs this excess energy which causes local warming and circulation disturbances. General circulation models developed by Haigh (1996), Shindell et al. (1999), and Balachandran et al. (1999) confirm that circulation changes, initially induced in the stratosphere, can penetrate into the troposphere and influence temperature, air pressure, Hadley circulation, and storm tracks by changing the distribution of large amounts of energy already present in the atmosphere. 31 prominent scientists and researchers who have words that governments ought to start heeding. He predicts the current pattern of temperature increase of 0.5C /100 years resulting from natural causes will continue with alternating cooling as well as warming phases. He shows cooling for the next cycle until about 2030/ 2040. And again a new paper ON THE RECOVERY FROM LITTLE ICE AGE – Read here. He makes a prediction for one decade only, namely the next decade [2009-2019] and he basically shows the global average temperatures will decline to a range of about 14.18 C to 14.28 C from 14.39 C [eyeballing his graphs]. He also said that “you may well enter a decade or two of cooling relative to the present temperature level”, however he did not indicate when any two decades of cooling would happen or whether the second decade after the next decade will also be cooling. Read here and here. Also read The mini ice age starts here at dailymail.co.uk/. These cool and warm PDO regimes correlate well with the cooling and warming phases of GMTA shown in Figure 3. These scientists came to the same conclusions— the global warming trend is done, and a cooling trend is about to kick in. In the 1970s, leading scientists claimed that the world was threatened by an era of global cooling. 31. Dr. Karsten Brandt, Director of donnerwetter.de weather service. 1880 to 1915 cool period. 1915 to 1945 warm period. 1945 to 1977 cool period. 1999 to 2010 global cooling. Conventional temperature anomalies are in relation to a 30 year flat average moving “normal” climate but this obscures the normal global warming that has occurred since the ice ages. The IPCC estimates this warming to be 0,45 C/100 yr since the Maunder minimum. 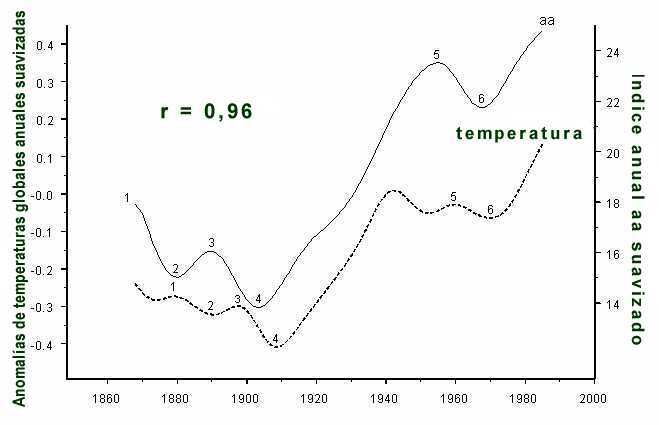 De-trending the 7SS simply requires the subtraction of actual composite temperatures from a linear rise of 0.45 C per century starting at the 1850 global average temperature of 13.6 C (y = 0.45x + 13.6). A linear regression of the resulting anomaly 1909-2009 yields y = 0.00456x – 2.33. Therefore, NZ has warmed 0.456 C over the last century in excess of the general warming since the LIA 1850. It was also 2.33 C cooler than global at 1909 and 1.874 cooler than global at 2009. NIWA has not done this. The global record exhibits a cyclical trend in addition to the linear rise and so does the 7SS NZTR. The cyclical trend is revealed by the best fitting polynomial curve. NIWA has not done this. Two papers: “Reconstruction of solar spectral irradiance since the Maunder minimum”, N. A. Krivova1, L. E. A. Vieira and S. K. Solanki, 2010 and “The Variable Solar Dynamo and the Forecast of Solar Activity; Influence on Surface Temperature”, C. De Jager, S.Duhau, in the book “Global Warming in the 21st Century” Copyright 2011 account for 0.15-0.19 C of the general warming by solar activity and 0.26-0.30 C from residual non-solar climatological causes (Akasofu 2010). NIWA has not done this. Linear regression of 7SS composite actual temperatures over the 30 year period 1980 – 2009 reveals +0.0075 C warming at +0.025 degrees per century. Regression of the last 11 years 1999 – 2009 yields cooling of -0.05145 C at a rate of -0.468 degrees per century. NIWA has not done this. 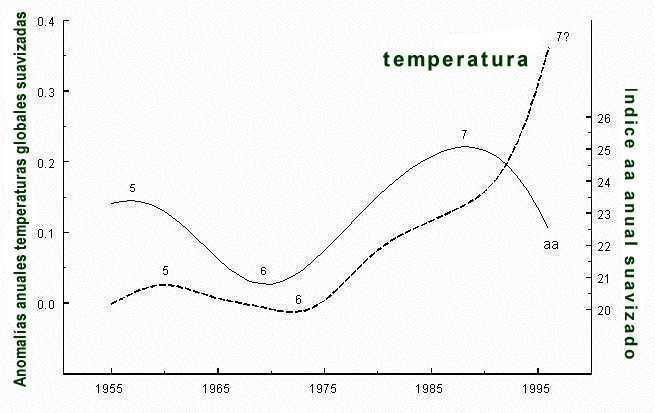 Most of the warming in the 7SS occurred circa 1960 prior to the spike in CO2 levels in the late 1970’s. Over the last decade CO2 levels continue to rise sharply but NZ temperatures are falling, revealing the break in apparent CO2-Temperature correlation. NIWA has not done this. Synopsis: negligent analysis by NIWA. Plotting a 15 year moving average of the 7SS composite actual temperature clearly shows that 0.4 C of the 0.9 C rise 1909-2009 occurred abruptly from 1953 to 1963. I have used the IPCC estimate of 0.45 global average temperature rise per century but there are good grounds that 0.5 should be used. Readers that are paying attention will have observed in “The List” that Akasofu (2) and Latif (3) use 0.5 explicitly and implicitly respectively. This is because a rise of 0.45 per century starting with 13.6 at 1850 only yields 14.3155 C whereas 0.5 yields 14.395 C that is consistent with the latest global average (See – “The List”, Latif, 3). De-trending the 7SS using y = 0.5x + 13.6 yields NZ local warming 1909-2009 of 0.4 C (y = 0.004066x -2.33446). This plot from “New Little Ice Age Instead of Global Warming?” shows the perfect correlation of the Gleissberg cycle (thin line) with temperature (thick line) as opposed to the non-existent CO2 correlation over the same period. The Gleissberg cycle is a smoothed time series of the length of the sunspot cycle (LSC). “…..nearly all Gleissberg minima back to 300 A.D., as for instance around 1670 (Maunder minimum), 1810 (Dalton minimum), and 1895, coincided with cool climate in the Northern Hemisphere, whereas Gleissberg maxima went along with warm climate as for instance around 1130 (Medieval climate optimum). The degree of temperature change was proportional to the respective amplitudes in the Gleissberg cycle. The lag of the temperature data suggests that some of the excess energy linked to solar activity is stored and accumulated in the climate system by processes taking years. Oceans are a candidate because of their thermal inertia. “Fig. 7 from Landscheidt (2000) is an extension of the data in Fig. 6. It can be seen that the aa-curve reaches its highest maximum, marked by number 7, around 1990 and shows a steep decline afterwards. Allowing for a lag of 8 years, the highest maximum in the curve of global temperature should have occurred around 1998. This was the year with the highest surface temperature observed since the establishment of international meteorological services. The Primary and Secondary Climate Drivers. A compilation of papers and articles evidencing solar, lunar, cosmic ray and celestial influence on climate change. Variation of cosmic ray flux and global cloud coverage–a missing link in solar-climate relationships. WHAT IS THE MAIN FACTOR CONTROLLING THE MURRAY DARLING BASIN SYSTEM RAINFALL (SOUTH QLD-NEW SOUTH WALES-VICTORIA & SOUTH AUSTRALIA AREAS)? It was found that the South Pacific Oscillation (SO) is influenced by Sun activity similar to the North Atlantic Oscillation (NAO). Especially during the warming period from 1980 to 2009 the oscillation of Sunwind – Index “aa “ was in good resonance with the delayed South Pacific Oscillation. The same observation was found between the Oscillation of Cosmic Radiation, which is controlled by the Forbush – Reduction by the magnetic fields of the sun protons of the Sunwind and the delayed SO. McLean, de Freitas, and Carter 2009. I propose a simpler plan of attack on the ETS RIA. 2) Presentation of “The Primary and Secondary Climate Drivers”, a compilation of papers and articles evidencing solar, lunar, cosmic ray and celestial influence on climate change. (GSTA) as per “On the trend, detrending, and variability of nonlinear and nonstationary time series”, Wu, Norden, Huang, Steven, Long, and Peng, 2007 and 7SS NZTR using the same methodology. Predict a Maunder-type minimum beginning 2020-2030. If we stick to the recovery from the LIA, alternate climate driver hypotheses and temperature trends using up-to-date stats methods, it’s a whole lot simpler. i.e Avoid physics and paleogeology like the plague (with respect to ex-geophysicists of course). Hey! The only geophysics I ever did was in the pay of Big Oil. @Andy if you see this. Is this how XML works? @Richard T. This may be worth a post. I’m emailing Don Easterbrook to find out his basis for 1905 being his first data point and the NOAA contact Bruce Bauer to ascertain the correct “present” date for GISP2 temperature..
First data point 0.0951409 x 1000 years before “present” in the temperature record. The first data point in the file is at 95 years BP, and shown in his graph. 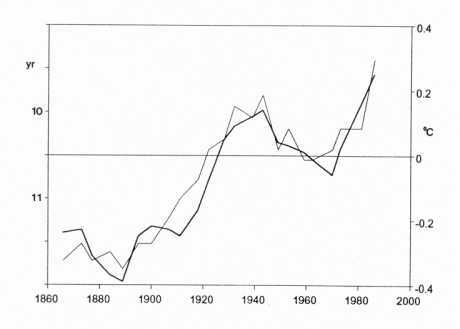 In other words, Don presents 1905 as equivalent to the present — a point I emphasised the last time he used this data. However, we were both wrong. I’m not an expert in XML but this seems to indicate that that the “present” date for temperature is 2000 AD and the “present” date for ice accumulation rate (meters/year) is 1950 AD. I do think Don’s plot is misleading by presenting 1905 as present instead of adding a value for 2010 but whether Gareth’s use of GRIP data is valid, I don’t know. Using Gareth’s GRIP reasoning for 1905-2000 the difference would be more like 2.44 C instead of the 1.44 C he came up with for 1850-2000 because 1905 was cooler than 1850 on the GRIP plot. i.e you can’t assign different meanings to the two elements. The XML file seems to be an industry standard metadata file. And the first data is explicitly at 1.5m -38 (yrs BP 1950) i.e. 1988. 2000 is when the coring project starts but the temp reconstruction does not start until coring is 145 yrs down if 1950 is P or 95 yrs down if 2000 is P.
I’m not convinced by your explanation because ice accumulation rate uses the 1950 P convention as clearly shown in the metadata (Paleo_Stop_Date -50 cal yr BP) but Temperature is stated differently (Paleo_Stop_Date 2000 AD). it seems to me that the Paleo_Temporal_Coverage elements are assigning 2 different conventions. You may be right that they are one and the same but I’m interested to see what the NOAA contact says. If you have a contact then I agree it is best to confirm with them than resort to guesswork. Drilling of the GISP2 ice core was completed in 1993, which precludes a top-of-the-core date of 2000. After the drilling, additonal firn studies were made so data may be available to 2000, but it isn’t from the top of the core. 1950 is the date used by ice core researchers as a common starting point, but it’s not the top of the core. If you look at the original oxygen isotope data of Stuiver and Grootes (available at the Univ. of Washington website) you will see that the top of their data set is 1987. Alley’s curve begins at 95 years before 1950 (1855), so CO2 dogmatists are claiming that is the top of core, but that is incorrect. Alley states that “Temperature interpretation based on stable isotope analysis, and ice accumulation data, from the GISP2 ice core, central Greenland. Data are smoothed from original measurements published by Cuffey and Clow (1997).” So, going back to the the Cuffey and Clow curve that Alley’s curve is based on, that curve begins at 0 yrs and they state: “We chose to calibrate the GISP2 δ18O raw data as given by Grootes et al. (1993) and Stuiver et al. (1995),” which clearly starts in 1987. Thus, the Cuffey and Clow curve apparently begins in 1987, not 1950 or 1855. Temperatures in Greenland from 1935 to 1940 were about 1 degree C (1.8 degrees F) warmer than in 2005 (see attached temp curve), so it has not been warmer in Greenland since 1940. The isotope data set of Stuiver and Grootes includes 47 years after 1940, and since it has not been warmer in Greenland since 1940, Greenland has not been warmer than it was at the top of the ice core (1987). If you draw a straight horizontal line from the 0 point (1987) in the Cuffy and Clow curve, all of the Holocene temps are above that line. Alley’s curve is slightly different, showing a few cooler times (e.g., Little Ice Age). The conclusion that more than 9,000 of the past 10,500 years were warmer than present is thus confirmed. “(see attached temp curve)” refers to “Greenland temp curve 1880-2004.jpg” that I’m unable to find on the internet but is available from me here rscumming@gmail.com. Both this plot and the GRIP 1840-2009 plot at HT (“Easterbrook’s wrong (again)” post) show the 1940s warming that the CO2 forced models cannot hindcast BTW. A 1987 start date sets the first data point in the GISP2 temperature reconstruction at 1892 (95 BP 1987) according to Don’s reply. I agree with GR that Don should include an estimate of 2010 (or 1987) temperature on his disputed Fig 5. but GR could be wrong about 1855 being the first data point (possibly 1892). I’ve thanked Don for his reply and have asked for a comment on the Fig 5 suggestion. Stil waiting for Bruce Bauer’s reply (NOAA). This means GR is right and DE should add a 2010 estimate to the 1855 data point on his Fig 5 in order to establish the present for comparison of the last 10,000 years of GISP2. 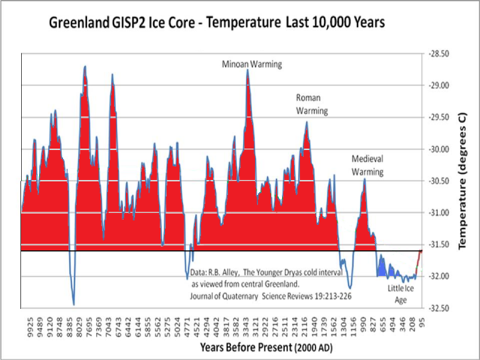 If Don had added a 2000-2010 temperature estimate to his graph, the baseline rises by just over 1C (1.44 using GRIP) so that “9,100” reduces to about 4500? above that over the last 10,000 years – still a considerable amount. I am confronting him on this but so far he has been intractable. On reflection, the focus should be on 2) for simplicity. Presentation of “The Primary and Secondary Climate Drivers”, a compilation of papers and articles evidencing solar, lunar, cosmic ray and celestial influence on climate change. With emphasis on predictive skill. GR at HT is still on DE’s case too.